18 in hardcopy and e-Book formats. 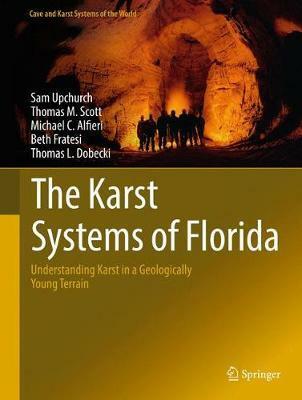 Using the State of Florida as their laboratory, the textbook synthesizes and discusses the geology, hydrogeology, and water quality/geochemistry of karst systems in a geologically young (eogenetic) terrain, where rocks as young as 125,000 years and as old as 65 million years have developed karst features, such as springs, sinkholes, and caves. The eogenetic karst of Florida is largely covered with sand- and clay-rich cover materials. This textbook extensively discusses the interactions of karst processes with cover materials and the resulting karst features and landscapes. A professionally licensed geologist in thirteen states and a nationally certified/registered hydrogeologist with over 20 years’ experience, Mr. Alfieri manages the operation of hydrogeologic services for Water Resource Associates, LLC (WRA). As the Principal Hydrogeologist at WRA, he provides: geologic, hydrogeologic, and karst science interpretation and evaluations; consumptive/water use permitting assistance; alternative water supply solutions; groundwater flow and contaminant fate and transport modeling; and expert witness services. Mr. Alfieri is a past Chair of the Florida Board of Professional Geologists and the Chairman of ASTM Sub-Committee D18.21.03: Well Design, Maintenance & Construction.